← The Revolution Will Not Be Televised. But it will be on Facebook, Twitter and YouTube. I’m frequently asked which apps I’ve got on my iPad by friends, colleagues and clients, alike. Notice OutPost and OmniFocus in my dock. But unlike most folks, who use their iPads for entertainment and have a gang of apps on their devices, from Angry Birds to HBO Go, and everything in between, I primarily use my iPad for work, and my apps are focused on productivity. And while I’m sure you were ready for a juicy, fun, exciting or at least interesting “top 5 apps” list, this one will probably be very dry by comparison. But among my six loyal readers, I’m certain that one of you will be rewarded with a salient or applicable take-away. 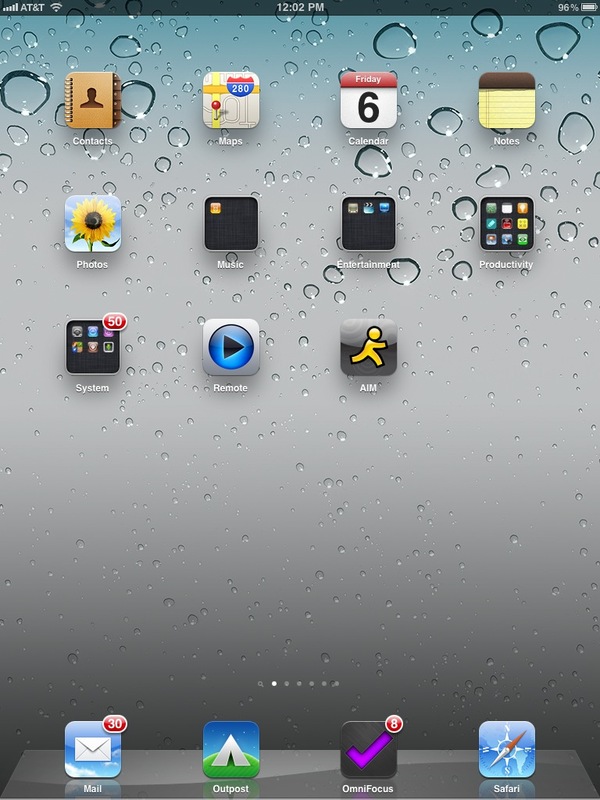 So without further ado, reader “X”, here are my Top 5 iPad Apps. OmniOutliner is the ultimate outlining app. For most of my clients, I am really a glorified project manager. In this capacity, I’m routinely called upon to come up with creative ideas, and then figure out ways to design, develop, resource, implement, staff, deploy, track and report – essentially everything from ideation through execution. I’ve found that being able to outline projects, from start to finish, and make adjustments on the fly is critical to managing all these moving parts effectively and efficiently. OmniOutliner, by The Omni Group, is the perfect tool for creating, manipulating and sharing outlines. OmniOutiner’s most appealing feature is it’s ease of use and malleability. I’ve created instruction manuals, proposals, schedules, equipment lists, budgets, you name it, with OmniOutliner. From basic text/data entry, to hierarchical organization, lists, attachments, notes, reminders – I could go on and on – OmniOutliner is an organizational godsend. The perfect tool for mapping ish out! If you’re a visual person or think in pictures, you probably find your notes peppered with sketches, diagrams, flow-charts and various other forms of doodles and drawings. While your scrawling may appear to be scribbling and goofing-off to the casual observer, you know that these crude drawings are replete with meaning and value. Your Moleskin notebooks are probably full of such drawings, which may (or may not) ever be referenced or used again, relegated to some dusty shelf of half-baked ideas. OmniGraffle, also by the Omni Group, saves your (probably) good ideas from a life of obscurity, by making them useful and understandable by the common man, team member or just you. 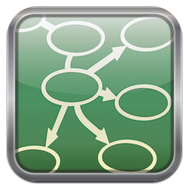 OmniGraffle lets you create “graffles” (or drawings), maps, flow charts, organizational diagrams, wireframes, processes, or layouts, using stencils, lines, connectors and a host of useful tools. Using the iPad screen as a canvas, OnmiGraffle can even take your hand-drawn sketch and turn it into something immediately useful. OmniFocus helps you organize disparate thoughts. Sometimes, you just want to jot down a thought, note, to-do or what-have-you because you don’t want to lose or forget the thought. If the impulse to jot down a thought happens to you a lot, you’ve probably got a collection of scraps of paper, and/or fragments of ideas, notes and reminders, scattered about. If you could assemble them in one place, you’d probably have a fully formed thought, idea or plan of action among those various disparate thoughts. 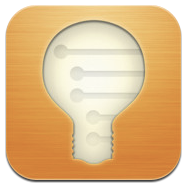 OmniFocus, by (once again) the Omni Group, helps to coral your random note-taking, thought-jotting, to-do-ing(? ), and helps you, well, focus. 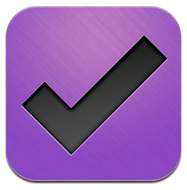 OmniFocus is all about task management, helping you to define, assign, prioritize, track and manage tasks. With a simple-to-use interface, synching between multiple instances of OmniFocus, and integration with your calendar, it’s the perfect tool for staying organized. As a Basecamp junkie (FYI Basecamp is a web-based project management and online collaboration tool developed by 37signals), being able to access my Basecamp account is critical to staying on top of my projects. Sometimes, however, when wi-fi isn’t available and my 3G is spotty, accessing my account sometimes proves challenging. 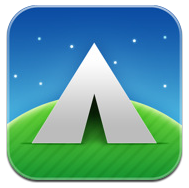 OutPost, by Enormego, is an app that puts Basecamp on your iPad (and iPhone). OutPost give you access to all of your accounts, projects, messages, assignments, contacts, calendars, milestones, writeboards and time-tracking. It also synchronizes your activities, so that all your activities in Outpost seamlessly integrate with the Basecamp account. OutPost is the ultimate in on-the-go productivity. *Note: OutPost is one of the “buggier” apps that I use. It’s prone to frequent crashing. Can we work on this Enormego? Hello? If you’re like me, whenever you take a meeting, you take meticulous notes. I’ve always been really good about recalling the details of conversations – even when I wasn’t taking notes. But sometimes, people talk fast, you mishear something or you get so caught up listening, that you stop writing. Even the most meticulous note-taker missed an element or two, that for the life of them and despite their best efforts, they can’t recall. SoundPaper, by David Estes, remedies that. SoundPaper is a really handy app that combines a notepad with audio recording capabilities. Simply click record and SoundPaper will automatically begin recording audio. What’s especially cool about it, is that the recording is linked to your note-taking. SoundPaper is really useful for lectures and other scenarios when your note-taking might not match the pace of the speaker. So if you get caught up and can’t recall what was said, simply click on a word and SoundPaper takes you to the exact session and you can play back the audio you missed. 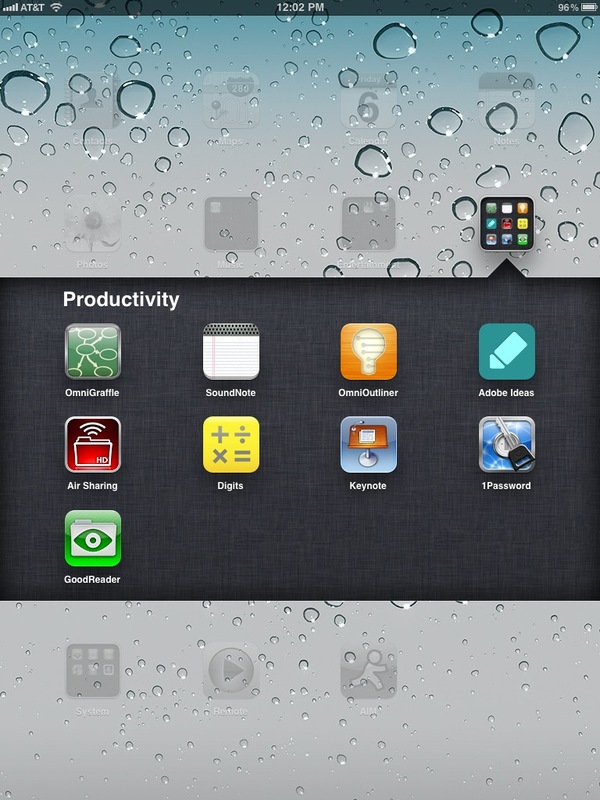 Three of the big five are in my "Productivity" tab: OmniGraffle, SoundPaper and OmniOutliner. I’ve got a few other apps on my iPad, that I use from time-to-time, but these five are my “go-to” apps that keep me focused, organized and on-point. If you’re looking to get yourself organized in 2012, and you’re planning on using your iPad to help you do it, then by all means, check out the apps I use! Thanks Mickel. I’m going to check it out!